I will never understand why the addition of bacon to any item, automatically makes it unhealthy. Often times, the item before the bacon, is already unhealthy. But yet for whatever reason, throw some bacon in it and it just puts the item over the edge. As a non-bacon eater, I really don’t see the big deal. Yes, I realize bacon is not really the healthiest thing you can eat but, if you are already eating one of the USA’s big ol’ meals, the bacon isn’t really going to make or break you. It seems the Bacon Sundae from Burger King is getting a lot of press and people are stunned. I guess they forget about the bacon sundae from Denny’s or the bacon shake from Jack in the Box. To me, this is just another item in the long list of bacon-esq goodies. However, I was still somewhat excited for the sundae and will admit I went out the first weekend it was available to get one. And I don’t even like bacon. 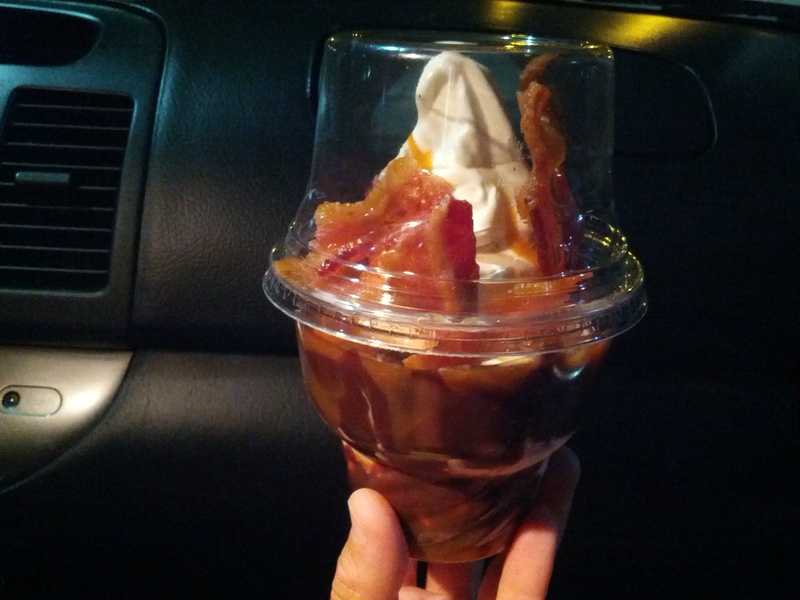 The Bacon Sundae from Burger King, is one of the items in their new summer time menu. In the King’s desperate attempt to regain the #2 spot in fast food, they are putting out new items left and right. The Bacon Sundae consists of soft serve vanilla ice cream, caramel sauce, chocolate fudge sauce, chopped bacon and a full slice of bacon. 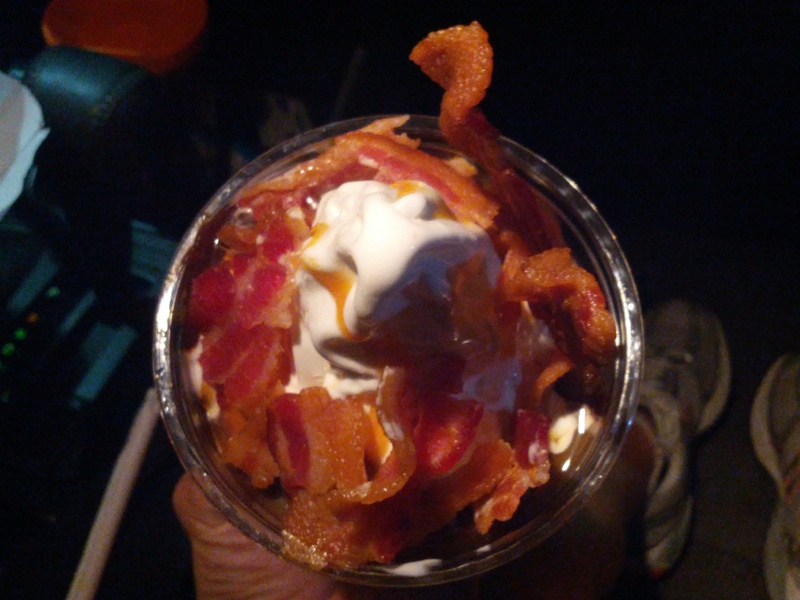 Prior to my trial of the Bacon Sundae, I had never had the ice cream from Burger King. Even though it’s been out for some time, I just really don’t visit the BK all too often. I rolled into the drive thru of the BK at about 9:00pm on a Friday night. Yes, this is really late for me. I am normally in bed at this time. I placed my order for the Bacon Sundae and anxiously awaited it’s arrival. As I mentioned, I don’t like bacon – at all. Bacon is one of those things that even the smell of it makes me kinda dry heave. So don’t ask why I was so excited for this sucker. I have some major food issues. As my Sundae moved from the pick-up window into my hands, I was astounded by it. This Bacon Sundae had an insane amount of bacon on it. While I did not see any chopped pieces of bacon, I saw 4 huge pieces and additional segments of smaller pieces. This thing was loaded. I also thought the weight of the sundae was pretty hefty. The cup was entirely full of ice cream with the bacon & sauces topping it off. Even though I do not like bacon at all, I decided that I needed to try one bite of the sundae with the bacon. I scooped up ice cream, a smaller piece of bacon, caramel & chocolate sauce and placed it in my mouth. As the flavors began to permeate my taste buds, my mind began to realize this was one Porky Treat. I did not like the taste of the bacon at all but, I wasn’t expecting to. The bacon was a thicker cut and very, very, very salty. This did play well with the cool ice cream and the thicker-textures of the sauces. Overall, if you like sweet & salty, bacon & goodies, you will really enjoy this sundae. I removed the rest of the bacon pieces from my cup and continued to eat. I was really impressed with BK’s soft serve ice cream. The ice cream was the thickest soft serve I have had and I loved it. It melted so perfectly in my mouth and the flavor was spot on. I would easily go back for this soft serve again. I also really enjoyed the caramel and chocolate fudge sauces. While I prefer hot fudge to chocolate sauce, this sauce had more of a fudge taste and less of a Hersey’s syrup taste. The caramel had the perfect blend of salty-and-sweet to it and was thicker in consistency. I loved mixing the caramel, chocolate fudge and ice cream together on this sundae and had no problem finishing it off. While I did not like the bacon, I wasn’t expecting to so I did not feel jipped in any way. The sundae was a cool $2.49 which I think is a great price. There is a huge amount of ice cream and toppings – especially bacon. I did taste remnants of the bacon flavor on multiple bites of ice cream. While I didn’t love these bites, I think it is yet another advantage for people who enjoy bacon. I give props to BK for introducing this sundae to their line up of items. Go for it BK – add all the bacon you want. While Dr. Oz will throw mean comments at you, the items will still be eaten. And as for this Bacon Sundae, I give it my stamp of one Porky Treat.